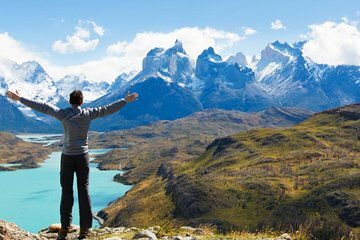 Spend five days exploring the beautiful nature of Torres del Paine National Park with this small-group tour from Puerto Natales. Over the course of your trip, you'll hike through the Francés Valley, sleeping in mountain lodges along the way, and get the chance to see the Grey Glacier at the south of Chilean Patagonia's Southern Ice Fields. All Meals included as per itinerary (B=breakfast, L=lunch or lunch box, D=dinner). Box lunch on return day to Torres del Paine. Guests must go to our office in Puerto Natales to get vouchers, map, and any other necessary documents. According to the Tax Code, to be exempt from the 19% VAT, international guests must provide the following documents upon check-in: Passport and Immigration Form (given by the Immigration Officer upon arrival). If the documents are not provided, the tax will be charged in CLP at the beginning of the program.